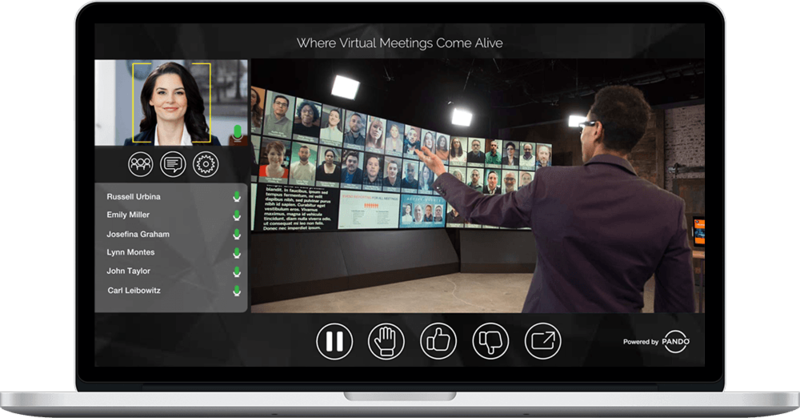 PandoTM is a totally new meeting technology platform that integrates face-to face communication, built-in features designed for lean-in engagement, a full video studio production crew, and a live moderator. The 40-foot Pandorama video wall is the hub of the meeting, enabling dynamic, real-time, face-to-face interactions and discussion between the moderator and all wall participants. 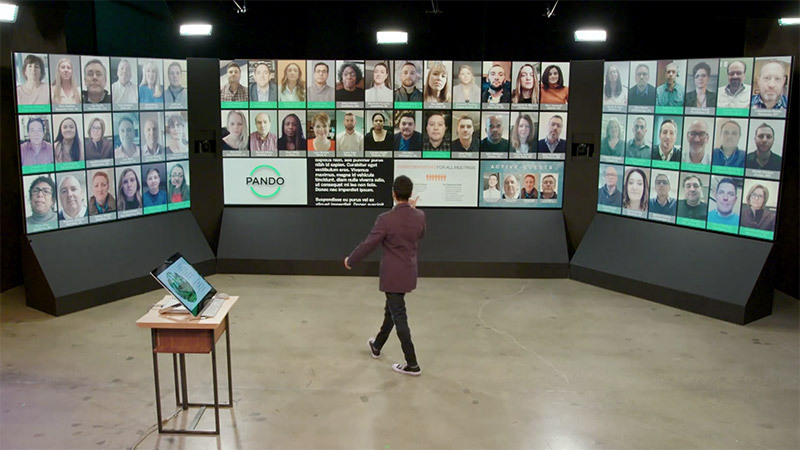 Pando puts the moderator center stage, controlling the flow of the meeting, interacting with participants, introducing other speakers and presenters, and communicating with the studio production crew to ensure an optimal meeting experience. The Pando magic starts in the control room. Much like a television studio, the video production crew manages the meeting flow with the moderator ensuring that participant audio and video feeds, studio cameras, and external content are optimized to deliver a highly interactive meeting experience. 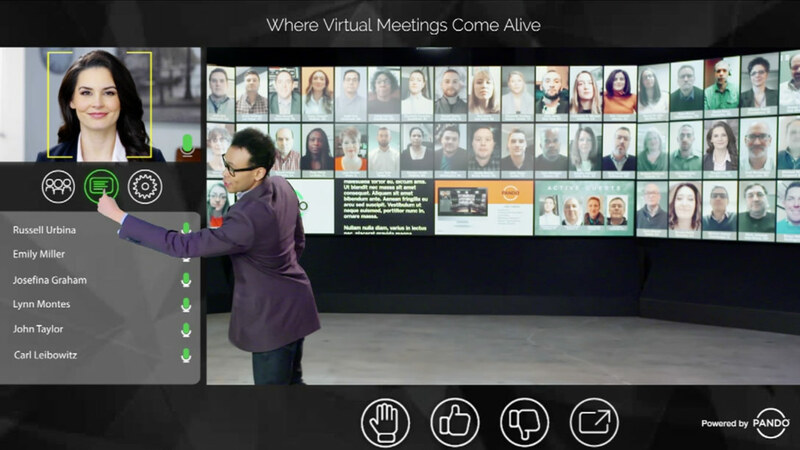 Wall participants are able to communicate and engage similarly to how they would if they were attending a live meeting. Up to 60 people can participate on the video wall. 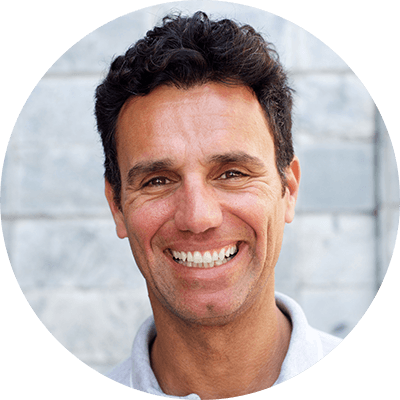 Wall participants are greeted by a live person and on-boarding usually takes less than 30 seconds. Pando supports up to 5,000 off-wall participants and/or observers. Off-wall participants can engage by using all of the platform’s tools, but are not displayed on the Pandorama video wall. Observers do not participate, but can view the meeting in real-time. Participants partake in a live production that follows the conversation seamlessly. 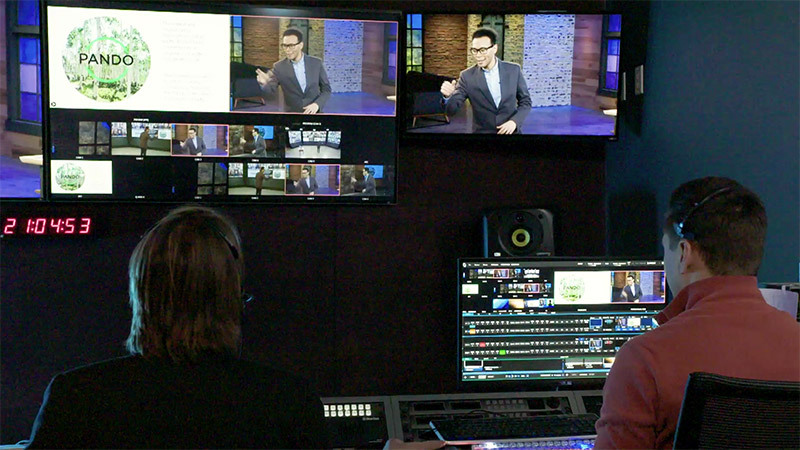 The production crew ensures that they see the meeting in the in the same way they would if they were attending in person, with cameras shifting from the moderator and studio to other participants who are speaking to content. 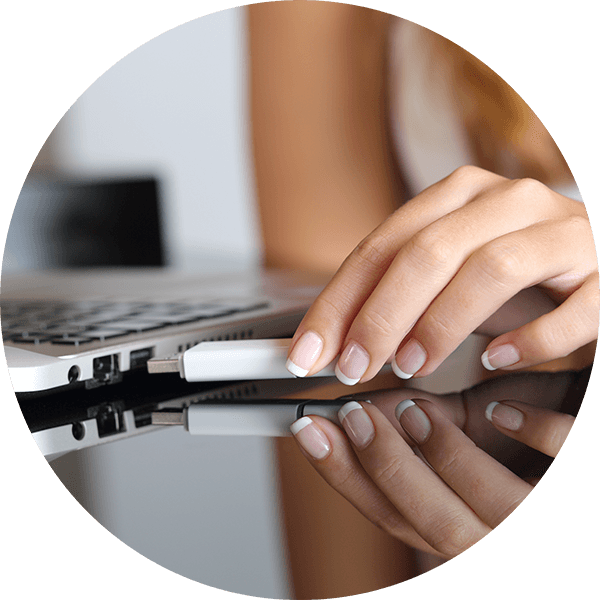 Built-in communication tools enable active participation throughout. Pando is designed for the ultimate engagement experience, encouraging sustained participation, collaboration, and real-time dialogue. 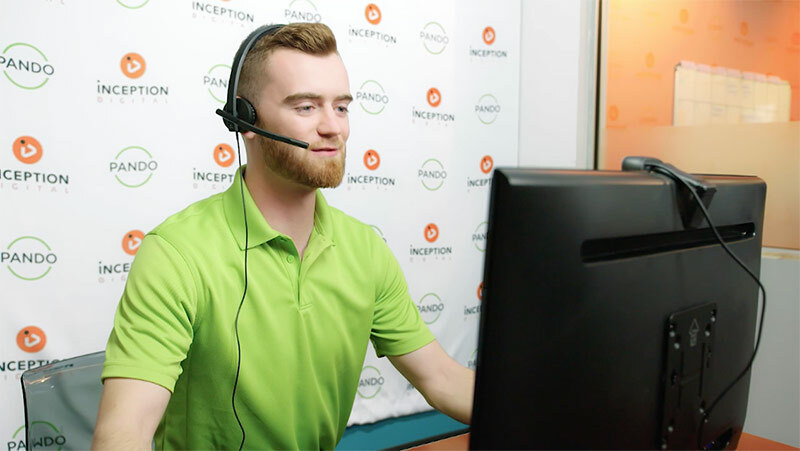 Participants are welcomed to Pando by a live person who ensures audio and video are optimal. No software to download or technical requirements other than Google Chrome and a camera. Participants pose questions and comments via a text box, which can either feed directly into the studio or go through a regulatory filter for approval. Surveys and polling questions can be built into the meeting with results instantaneously tabulated for real-time feedback and to facilitate further dialogue among participants. 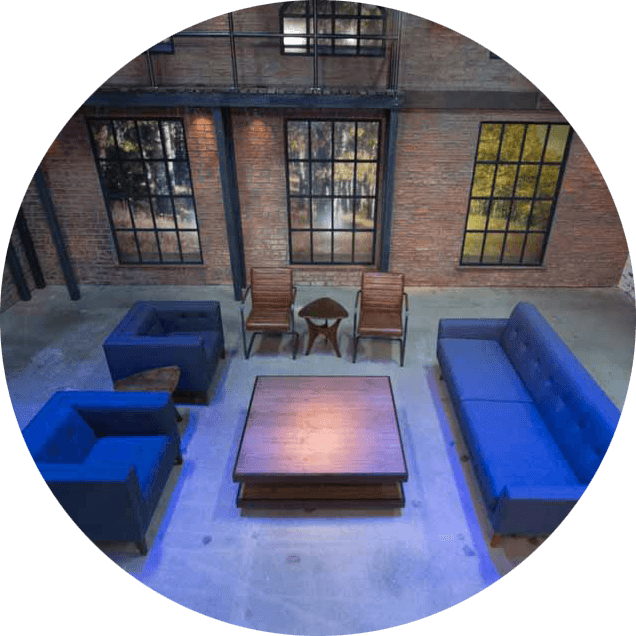 Limited only by the imagination, the Pando meeting possibilities are endless. 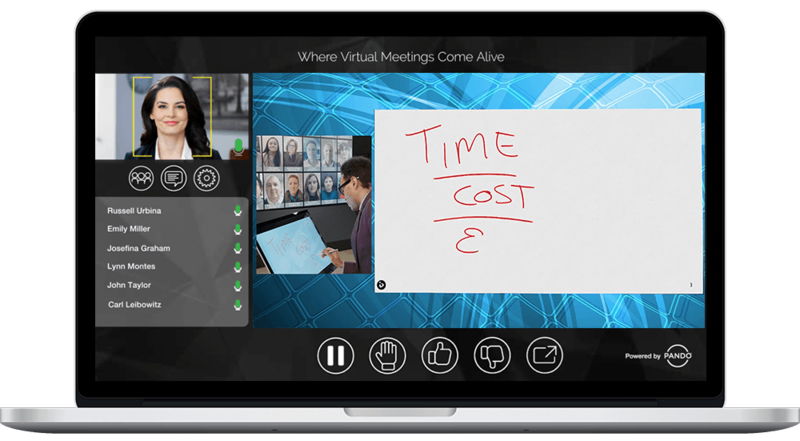 An ideal replacement or augmentation strategy for both external and internal meetings, Pando provides a cost effective option for diverse meetings where collaboration and engagement are critical. 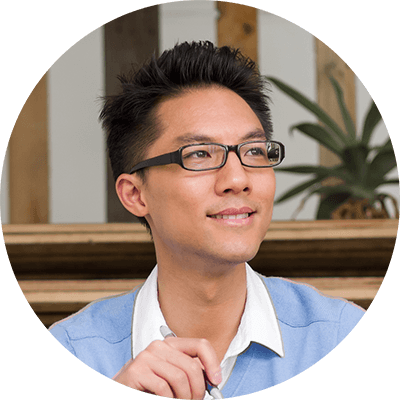 Learn more about how Pando can revolutionize your approach to live meetings. Regulatory teams can participate in meetings and intervene in real time. Questions can be filtered for approval first to ensure full regulatory compliance of the discussions. Regulatory teams can participate in meetings and intervene in real-time. Questions can be filtered for approval first to ensure full regulatory compliance of the discussions. 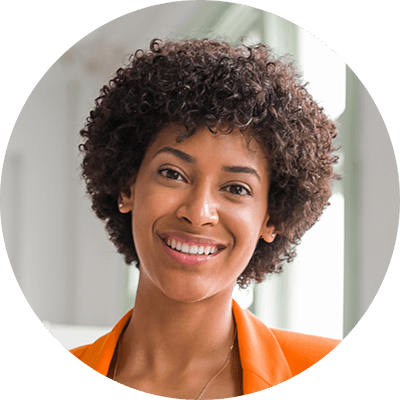 The proprietary insights platform measures participant engagement through a point system, starting with 100 points and adding or deleting points based on behaviors. Although the moderator is the only person required to be live, the Pando studio can accommodate up to 40 guests to observe or participate. Participants can easily engage in brainstorming and active dialogue. Whiteboarding is done on an in-studio MS Surface, which facilitates dynamic interaction.